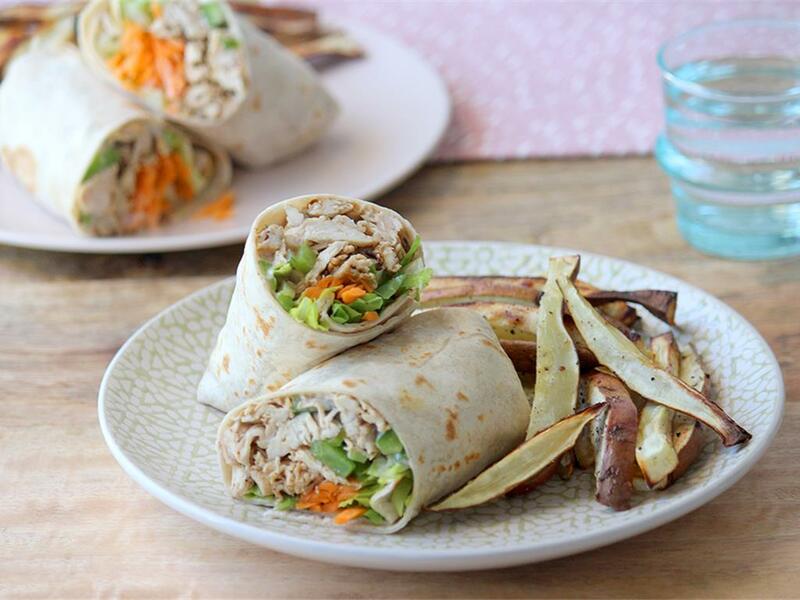 A toasted wrap filled with creamy mayo, grated carrots, shredded lettuce & chicken. Sweet potato chips: Cut off the ends, then cut them into 1cm slices lengthways and cut those slices into 1cm chips. Place the chips on a tin foil lined baking tray. Drizzle with olive oil, season with salt and pepper, mix and then spread in a single layer. Roast for 25 minutes, until golden and cooked. Chicken strips: Coat the chicken with the Chicken Spice, salt and pepper and olive oil. Place a pan on medium-high heat with a drizzle of olive oil. When the pan is hot, add the chicken and sauté for 3-4 minutes until golden. Use two forks to shred the chicken in the pan. Add the green pepper and celery and mix through. Wrap: Place in a dry pan on high heat and warm for 30 seconds a side until golden. Assemble the wrap by mixing together the mayonnaise and yoghurt and spreading it over the wrap. Top with the grated carrot, shredded lettuce and chicken. Serve by rolling up the wraps and serve the sweet potato chips on the side.